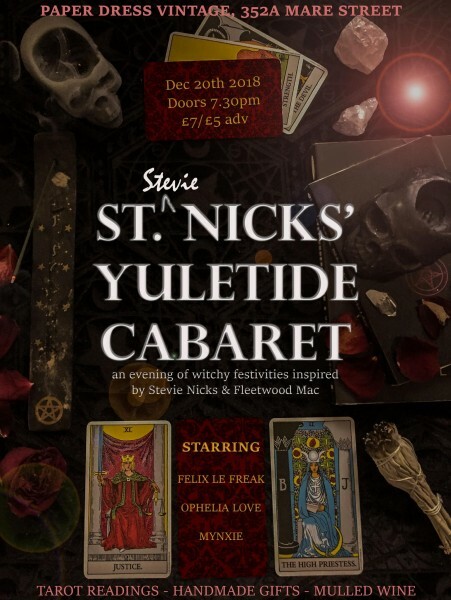 St. (Stevie) Nicks’ Yuletide Cabaret! Join us for a gorgeously witchy evening featuring the hits of Stevie Nicks & Fleetwood Mac! Doors will open at 7.30pm and we’ll be having cosy festive pre-solstice good times up until 12.30am, with entirely Stevie/Fleetwood inspired cabaret performances throughout the evening from Felix Le Freak, Ophelia Love and Mynxie. Supernova Tarot will be there doing tarot readings for £10, and there’ll be a variety of super cute handmade gifts available too, so bring some cash along with you! We’ve lit the incense and we’re brewing the mulled wine – so grab an advance ticket for a fiver and we’ll see you there!